THIRTY years on from Derry City’s historic entry into the League of Ireland, we’ve delved into the ‘Derry Journal’ archives to take a look back at the ‘Candy Stripes’ opening game of the 1985 season against Home Farm. 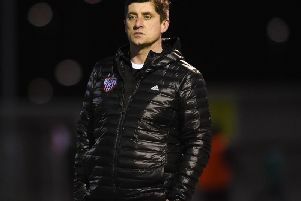 Led by manager, Jimbo Crossan and team captain, Terry Kelly, Derry made a winning start to their campaign, securing a 3-1 win over the Dublin side in front of thousands of supporters at Brandywell Stadium. “For a couple of hours on Sunday Derry people shrugged off the troubles of everyday life, forgot the ‘troubles’, and made it an unforgettable date in the town’s history as they welcomed senior soccer back after a lapse of 14 years,” said the front page of the ‘Derry Journal’ on September 10th 1985, two days after the match. A Gary Jones brace and a Barry McCreadie strike were enough to see off the opposition on a day when former Manchester City and Sunderland legend, Dennis Tueart starred for Derry City. Derry went football crazy as thousands streamed towards Brandywell to see Derry City celebrate becoming the first team North of the Border ever to play in League of Ireland competitions by defeating Dublin team Home Farm. September 1985... The Brandywell was packed to capacity for Derry City FC's return to senior soccer in the League of Ireland. Thousands of fans turned up for the Candy Stripe's first game against Home Farm.